I have long wondered whether some East Asian handscroll paintings have been narrative, rather than just showing wondrous landscapes. When I came across the Japanese Night Attack on the Sanjō Palace I was delighted, and frustrated: here is one handscroll which tells a clear story, but where are the others? A new book by Cédric Laurent has finally answered my question, by examining in great detail five separate narrative painted handscrolls from China. As his book is in French, is quite expensive, and somewhat obscure, in this and a further two articles (to appear at roughly weekly intervals) I will examine three of these five examples. If you study the book, you will see that I depart from it slightly in the division of scenes in the stories; rather than slavishly copy Laurent’s work, I have used it as a bridge. Any mistakes here are mine alone. The first handscroll is one of the most remarkable artworks that I have come across. It is an anonymous copy of a handscroll originally painted by Gu Kaizhi 顾恺之 who lived between about 344 and 406 CE, in the Jin Dynasty, and that original (now lost) would have been made before 400 CE – a millenium before the start of the Renaissance in Europe. 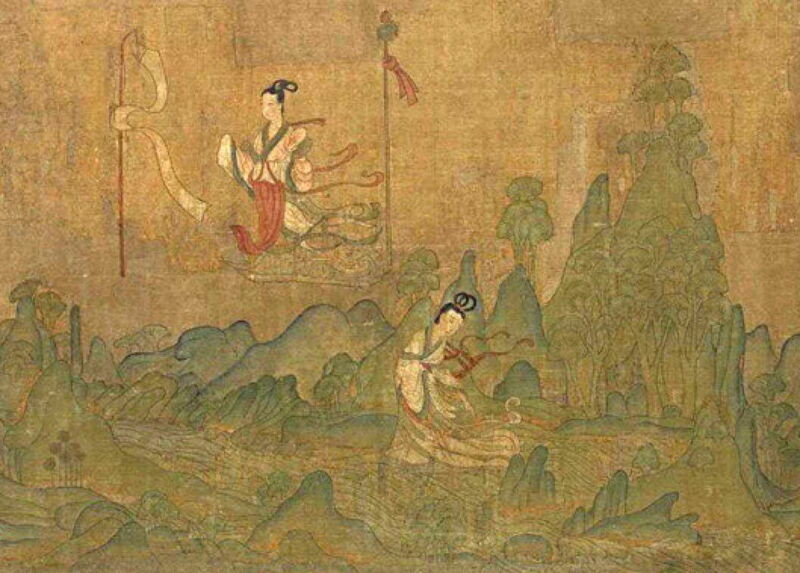 This painting tells the story originally created by Cao Zhi 曹植, who lived between 192-232 CE: his Ode to the Nymph of the Luo River, composed in 222 CE, during the Han Dynasty. The copy that I show here is believed to have been made in the period between 960-1279, and is now preserved in the Palace Museum in Beijing, China. As with all handscrolls, it is read from right to left, and designed to be viewed one section or scene at a time. There are at least four different copies which appear to have been made of Gu’s original, and others are held in the British Museum, London, the Freer Gallery of Art, Washington, DC, and the Liaoning Provincial Museum in Shenyang. Although their contents differ, Laurent’s comparative analysis leaves no doubt that they are derived from a common original, which tells the same story drawn from Cao’s poem. Gu Kaizhi 顾恺之 (copy after) (c 344-406), Nymph of the Luo River 洛神賦 (960-1279), ink and colours on silk handscroll, 27.1 x 572.8 cm, Palace Museum, Beijing, China. Wikimedia Commons. Because of its great length, I now work through each section or scene, from the right end to the left. The first scene, covering lines 5-16 of Cao’s poem, shows Cao’s arrival at Yanglin, and looking at the Luo River. Two horses are beside a servant, one apparently grazing, the other looking up. Behind, a third horse is rolling on its back on the meadow, with a second servant watching. In the second scene (lines 17-43), Cao sees the extraordinary vision of the nymph of the Luo River. He asks her who she is, and she confirms her identity. Two figures stand at the front of a group of people. The right figure is Cao, a prince, whose arms are outstretched. The other figures are assistants and servants who are attending him. Opposite that group is the nymph, with her distinctively-bunched hairstyle, who appears to be hovering in mid-air, ribbons from her robes blowing in the wind. 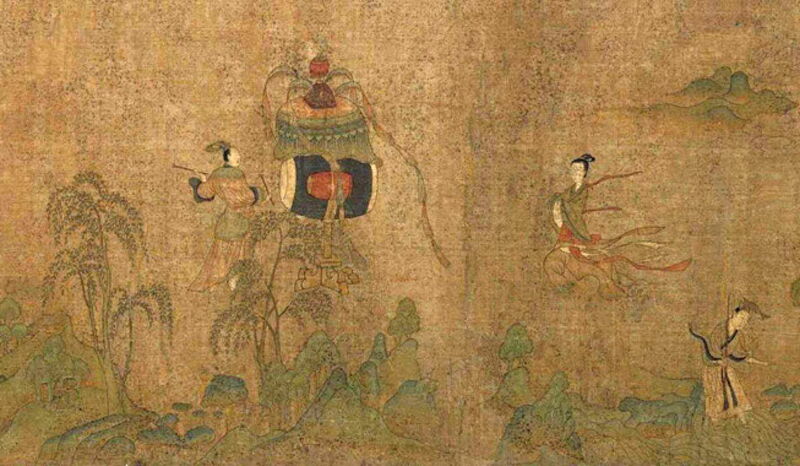 In the air between the nymph and Cao’s group is a dragon, and two flying geese. In the third scene (lines 44-77), Cao gives an elaborate description of the nymph’s beauty. She returns to the river, where she stays between two banners. The painting depicts her twice, initially as if she is low down and walking on the surface of the river. She is then shown again higher up, between two decorated vertical wands. This copy omits the next scene, covering lines 78-103 of the poem, in which Cao gives the nymph a pendant, and she gives him a precious stone. The next scene, from lines 104-121, is covered in two scenes in the scroll. 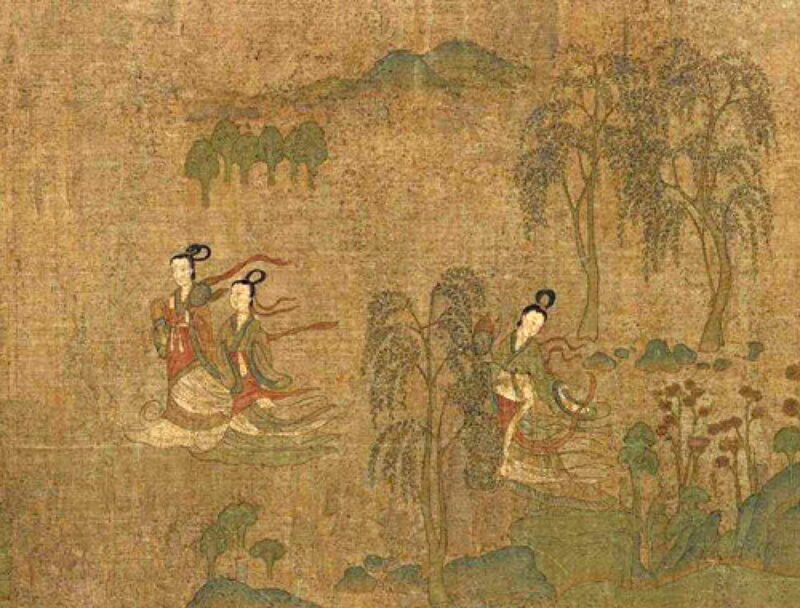 The nymph’s companion appears, and two concubines of Xiang follow them, holding the nymphs’ hands. In this first part of the depiction, two nymphs are seen together twice. At the right they are low down on the river surface, and at the left they are higher above it. In each case the nymph on the left holds a fan, and that on the right a lotus flower. In this section of the painting, three nymphs are shown. On the right, one stands on the water surface, holding a lotus flower. On the left two appear together: the nymph on the left is holding a fan, that on the right is significantly shorter, and follows slightly behind the taller nymph. In the sixth scene (lines 122-129), the nymph re-appears to Cao, who is so absorbed by her that he forgets to eat. Cao is shown seated on a small dais, with five servants in attendance. They are surrounded by trees, and two of the servants are fanning him. In front of the dais, and being watched intently by Cao, is a nymph, who is looking back at Cao. Above them, in the sky to the left, is a monster with a dragon head and white pantaloon trousers. 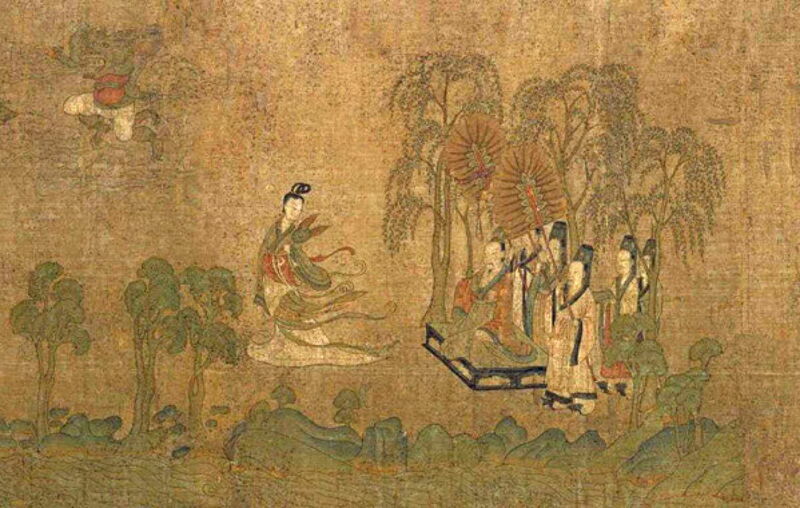 The following scene (lines 130-133) consists of Pingyi calming the wind, the Count of the River calming the waves, Fengyi beating a drum, and Nūwa singing in a clear voice. These are shown as a figure at the right, who is holding a rod, and bows towards Cao in the previous scene. Above the water, the nymph moves towards a large ceremonial drum, which is being struck by a man holding two drumsticks. In the eighth scene (lines 134-135), the nymph appears to Cao on a jade Phoenix. In the painting, Cao is now accompanied by only three servants, and is looking at the nymph, who is seated on a Phoenix, whose body forms a crescent behind her. The nymph looks back at Cao. 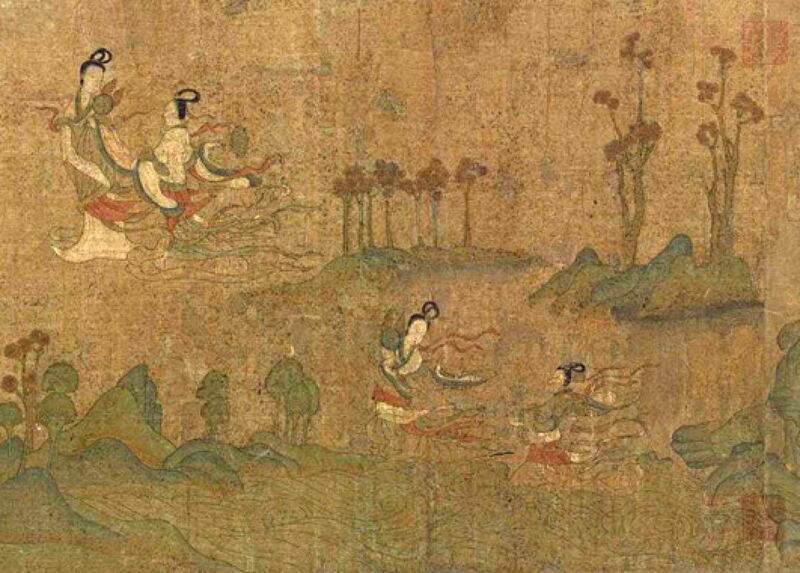 In the ninth scene (lines 136-153), the nymph is in a carriage of the waves, being drawn away by six solemn dragons. This is accompanied by whales and flying fish as it travels through the river. The nymph bids Cao farewell, then vanishes. The painting shows the nymph with a fan seated inside an elaborate carriage, whose tail streams many ribbons. It is being drawn by six deer-like animals, alternately coloured red and white. Another nymph is travelling in the carriage with her. 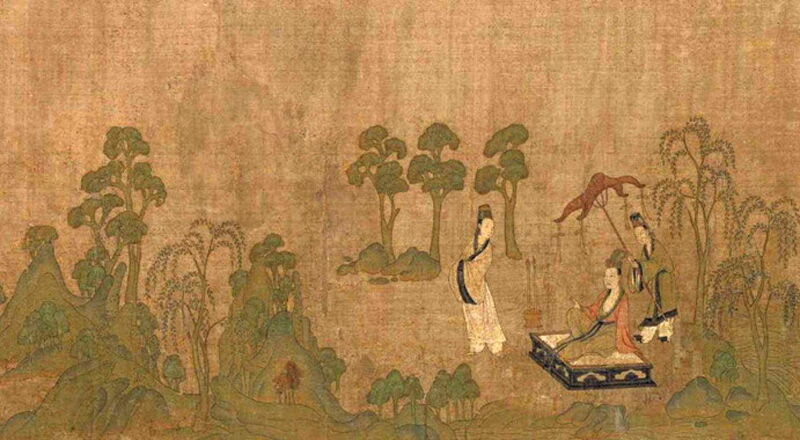 Huge fish accompany the carriage through the water, and two white deer-like creatures follow. Another white deer-like creature is behind those drawing the carriage. The tenth scene (lines 154-163) is of Cao searching in vain for the nymph from a boat. This is depicted as a substantial double-decked boat, travelling from right to left, powered by peculiar sails. Cao and two of his servants are shown on the top deck, and its two crew are shown on the outer lower deck. The penultimate scene (lines 164-165) is of Cao spending a sleepless night, longing for the nymph. In the painting, he is seen on a small dais, a single servant attending him. In front of him is the figure of an officer, who looks back over his left shoulder at Cao. In the final scene (lines 166-169), Cao returns sadly, in a conventional carriage. This is depicted as an analogue of the nymph’s river carriage, complete with its tail streamers. 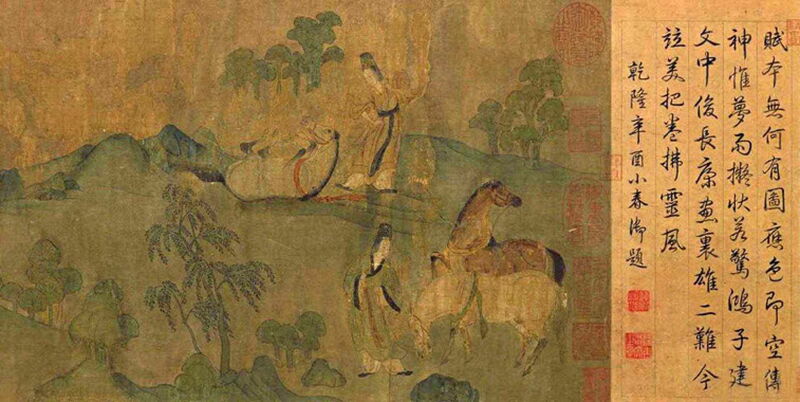 Here, the carriage has wheels, and is being drawn by five horses. Seated next to Cao is a woman whose hair is not bunched the same as the nymph’s, and who looks straight ahead. Three horsemen accompany Cao’s carriage: two on the far side, and one immediately behind. This handscroll clearly tells the story using a series of separate frames, each relating to a scene in the original text. At this level, the scroll is very similar to modern ‘comic’ books, although divisions between frames are implicit, cued by space and non-narrative elements such as plants and trees. The order of frames matches the sequence of scenes in the poem. Within some of the individual frames, there are multiple representations of the same figure – in scenes three and four above – which indicates the use of multiplex narrative. This handscroll goes beyond the superlatives that I can muster for its description. Although very ancient by any standards for art, it tells a complex narrative in exquisite detail, and demonstrates that such early East Asian painting can be thoroughly narrative in nature. Posted in General, Language, Life, Painting and tagged Cao Zhi, China, Chinese, Gu Kaizhi, handscroll, narrative, painting. Bookmark the permalink. Well, there are plenty of Chinese and Japanese paintings telling stories if you look into it though. Thank you. I’m sure there are. However, I’m afraid that I read neither Chinese nor Japanese, so am confined to the literature in European languages. If you can give me some accessible references to analyses, I’d be very grateful indeed.